Zeb Carter makes war when his team members are kidnapped. His pursuit of those responsible takes him to Mexico, Asia and finally to Syria, where he faces an ultimatum. 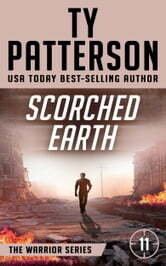 Scorched Earth is the eleventh thriller in the Warriors Series. Each novel can be read stand-alone. 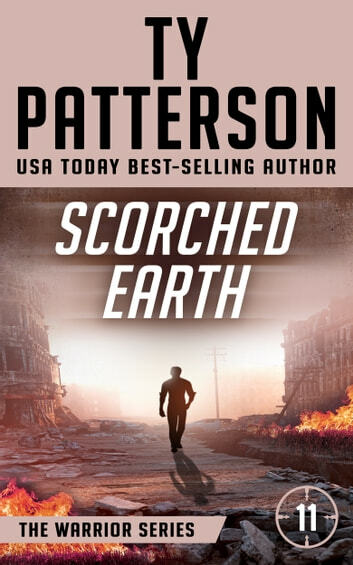 Scorched Earth has Ty Patterson's trademark storytelling with epic twists, faster-than-a-speeding-bullet pace, and zero-to-thrills in a page flip. If you like Lee Child, Vince Flynn and David Baldacci, you'll love Ty Patterson. WOW, this is the best one yet! The race is on almost for the the first page! These characters are so well written that I feel like they are living, breathing people! Now I have to wait for the next book! I have just read three hundred plus pages of unending action. Whew, I'm tired just reading it. However, putting it down was near impossible as well. Zeb Carter's team is his family. They are highly trained, genius smart, and have the respect of high-powered people the world over. They have just as many enemies. Training people to remain alert is necessary. A slip along with their innate goodness that is the twins resulted in their abduction. So begins the intricate plot. Who is behind the kidnapping? Why did they take the twins? Do they know the twins are more than part of the security company, part of a team that few people know exists and they answer to their boss, who only answers to the President? The entire team goes on the hunt which is ruthless with one thought in mind. Beware if you are in the way. I usually figure out the really bad guys before they are revealed. Never happen when I read a Ty Patterson book. The action is a film screen in your mind so well described you picture ever hit, every shot, every stab, and every explosion. Do not miss this one. If you are a Zeb Carter fan, you will see more of the BEAST. If you are new to his books (first now you will be a fan) you will see each team member's perfectly choreographed movements with rarely a verbal directive needed. Get the book. Settle back and buckle yourself in. As they say, "it's going to be a bumpy ride." I voluntarily reviewed this advanced reader copy and I have not been compensated in any way. What happens if you mess with the warriors? It ends very badly for you. Mr. Patterson once again takes us on a nail biting thrill ride of nonstop action. Paced just right so you get enough of an idea about what happens next to avoid being shocked and to enjoy the surprise and twists and turns along the way. A good old fashioned shoot-em-up. This book did not disappoint. Fast m0ving did not want to put it down. Zeb and the crew were great.